Enjoy a Béilini Plate (Irish Tapas) of Smoked Fish, Cured Meats, Regional Cheeses, Artisan Pickles and Ferments. Indulge in our unique Burren Panini, our take on an Irish Ruben with O’Herlihy’s Spiced Beef, Burren Gold Cheese, and our Chef’s Savage Craic Sauerkraut. Or try our Stone Baked Pizzas, Soups and Salads made with locally farmed ingredients, Seasonal Specials and a range of decadent Homemade Desserts.  Our Dishes follow the rhythm of the season drawing on the best of what the Burren has to offer and enlivening them with sweet and savory touches. Serving them with our delicious home made scones, breads, pickled vegetables and condiments. What better way to enjoy an afternoon than to soak up the tranquil atmosphere either indoors or in our garden with a glass of wine from our unique Wine List and some wonderful local cheese? The wine you choose might even be from a selection made by a family member in the South of France. You can enjoy the best of wine at shelf prices, consume some with your meal, re-cork your bottle and extend the drinking pleasure to later. We are situated just off the Burren Waymarked Walk so if you have worked up an appetite trekking through the Burren we are right here offering sustenance and relaxation.